Acacia rigidula extract is an ingredient that is used in a number of pre-workouts and weight loss supplements. Hailed by many people as the new DMAA, it is attracting some controversy due to the notion that it may contain amphetamine derivatives. Where does Acacia Rigidula come from? Acacia rigidula, also known as Vachellia rigidula or Blackbrush Acacia is a tree that is native to the south of America and Mexico. The extract that is used in supplements is prepared from the leaves of this plant. Acacia Rigidula is a plant with a controversial history. In the late 1990s, it was noticed that consuming the leaves of Acacia rigidula, a common forage crop for goats being raised in the area, caused the animals to experience uncoordination and difficulty walking. This led a scientific team to perform a thorough chemical analysis of the plant in an attempt to pinpoint a cause. The plant was previously known to contain four alkaloids with mild effects - N-methyl-β-phenethylamine, tyramine, N-methyltyramine, and hordenine - but this new research appeared to show that the plant contained another forty chemicals, including methamphetamine and a number of amphetamine derivatives not previously found in nature, powerful hallucinogens, and even nicotine (1). Over the years, supplement manufacturers, banned from the use of stimulants like ephedra and DMAA in their products, turned to Acacia Rigidula in light of its supposed similar properties, and it became a fixture in a number of slimming and pre-workout products. This eventually led, in 2013, to a US FDA investigation of the plant as well as a number of products containing Acacia Rigidula extract (2). The study found only the same four previously known and relatively benign alkaloids in the plant. This raised the strong suspicion that the earlier analysis had been contaminated or incorrectly interpreted, a position backed by the fact that the study was the only known instance where amphetamines had been found to naturally occur in a plant. Further adding to the controversy, the study found significant differences between the chemical profile of Acacia Rigidula and many of the products that claimed to contain this extract. β-Methylphenethylamine, a synthetic compound and amphetamine analogue, was found in 9 of the 21 samples surveyed, and the strong implication was made that many supplement manufacturers who are claiming Acacia Rigidula as an ingredient are adulterating their products with synthetic chemicals (2). The plant alkaloids in Acacia Rigidula (N-methyl-β-phenethylamine, tyramine, N-methyltyramine, and hordenine) belong to a class of chemical called the trace amines. These substances structurally resemble neurotransmitters, like dopamine, serotonin and noradrenaline. Trace amines are common in most foods, because they are produced by animals, plants and microbes. When eaten, these compounds may exert some non psychoactive stimulant effects on the body, including raised blood pressure and increased heart rate. Some people claim Acacia Rigidula improves mental focus. This class of chemical is known to increase basal metabolic rate. Synephrine (otherwise known as bitter orange) is a metabolite of tyramine, and closely realated to the other Acacia Rigidula alkaloids. Ingestion of synephrine has been shown to have positive effects on weight loss, particularly in overweight and obese people (3). It is likely that Acacia Rigidula extract would have a similar effect. Acacia Rigidula may have a mild stimulant and focus enhancing effect that makes it a worthwhile inclusion in pre-workout supplements. An increased metabolic rate enhances weight loss. This would be advantageous to anyone trying to get their body fat percentage down, an attribute which has been realised by many manufacturers of fat metabolisers who have included Acacia Rigidula on their list of ingredients. The active ingredients in Acacia Rigidula, tyramine and analogues, have been strongly implicated in migraine and cluster headaches. People who are prone to these afflictions are often placed on low tyramine diets to control frequency and intensity of this crippling condition, so supplements containing Acacia Rigidula are unsuitable for this section of the population (4). Similarly, this extract should be avoided by those taking a class of drug called Monoamine Oxidase Inhibitors. These active ingredients in Acacia Rigidula are metabolised by an enzyme in the body called Monoamine Oxidase (MAO), and inhibitors of this enzyme (MAOIs) are often used in the treatment of certain types of depression. The combination of high levels of tyramine and MAOIs are known to cause hypertensive crisis, a serious and severe elevation of the blood pressure which can cause symptoms such as organ failure and haemmorhage, and can be fatal (5). There is the possibility that Acacia Rigidula may give false positive results on a drug test, due to structural similarities to a number of substances which are banned in competition. While all the substances in Acacia Rigidula are legal, N-methyl-β-phenethylamine is an amphetamine analogue, and may be detected as such on less sophisticated tests. Elite athletes may wish to avoid Acacia Rigidula, as tyramine and its derivatives are directly metabolised to octopamine, an amine which is banned in competition by WADA (6). As the FDA report of 2013 showed, products that are labelled as Acacia Rigidula were very often adulterated with synthetic substances, including amphetamines. While this risk can be mitigated by purchasing from large and trusted brands, the potential to unintentionally consume a product that contains an illegal drug with a number of dangerous side effects is very present (2). While there is some work on the positive effects of tyramine metabolite, synephrine (bitter orange) on weight loss, there is currently no scientific research into the metabolic effects of Acacia Rigidula consumption in humans. In spite of these negatives, there is quite a bit of anecdotal evidence pointing to the idea that Acacia Rigidula extract is quite successful in promoting weight loss, and most people will not experience any side effects from the responsible use of a pure extract of this popular botanical. There is no recommended therapeutic dose for Acacia Rigidula, and any amount given would also depend on the purity of the extract. It is wisest to follow the instructions of the manufacturer of your particular supplement. Acacia Rigidula is commonly found in fat burning supplements, like Body War Body Shred, and Beauty Fit Beauty Reds. 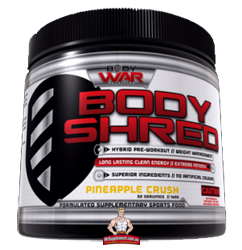 It has also been used as a replacement for banned stimulant DMAA in a number of strong pre-workouts, like APS Mesomorph 2.0, and Dorian Yates' Black Bombs. Acacia Rigidula and caffeine are thought to have a synergistic effect. Avoid taking Acacia Rigidula with Synephrine or Hordenine - you will be doubling up on dose. (1) Beverly A Clement, Christina M Goff, T.David A Forbes. Toxic amines and alkaloids from acacia rigidula. Phytochemistry Volume 49, Issue 5, 5 November 1998, Pages 1377–1380. (3) Stohs SJ, Preuss HG, Shara M. A review of the human clinical studies involving Citrus aurantium (bitter orange) extract and its primary protoalkaloid p-synephrine. Int J Med Sci. 2012;9(7):527-38. (5) Flockhart DA. Dietary restrictions and drug interactions with monoamine oxidase inhibitors: an update. J Clin Psychiatry. 2012;73 Suppl 1:17-24.